We’re happy to introduce new billing feature, that will help your company open up for new business opportunities: Post Paid Billing. HostBill offers variety of billing options to fit every business’ unique needs: from standard recurring invoice generation on a weekly, monthly or annual basis to more sophisticated models such as metered (fee based on resources usage over time), bandwidth (fee based on bandwidth usage/overages) or power billing (fee based on power usage/overages). Until now, when using standard billing models, HostBill allowed you to bill your customers on a pre-paid basis, which means the customer had to pay the invoice in advance. When the customer wanted to upgrade the package, the invoice for the upgrade was issued, and the upgraded service was available after the payment was made. From now on, we enable you to bill your customers on a post-paid basis, which allows the customer to pay for the service after they have used it. When Post Paid Billing option is enabled for your customers they can place orders on a regular basis, the same way as with pre-paid billing. The difference is the invoice is not generated and does not have to be paid at order time but after certain period, usually a month, during which the customer can use the service. Simply put, any services used throughout the month are billed at the end of the month. Post-paid customers will receive a monthly bill that will reflect all the charges incurred for the previous month. If the client needs to upgrade or downgrade the package, it can be done at any time, with the charges applied to the next invoice. For hosting accounts configuration you can choose billing type and billing cycle. 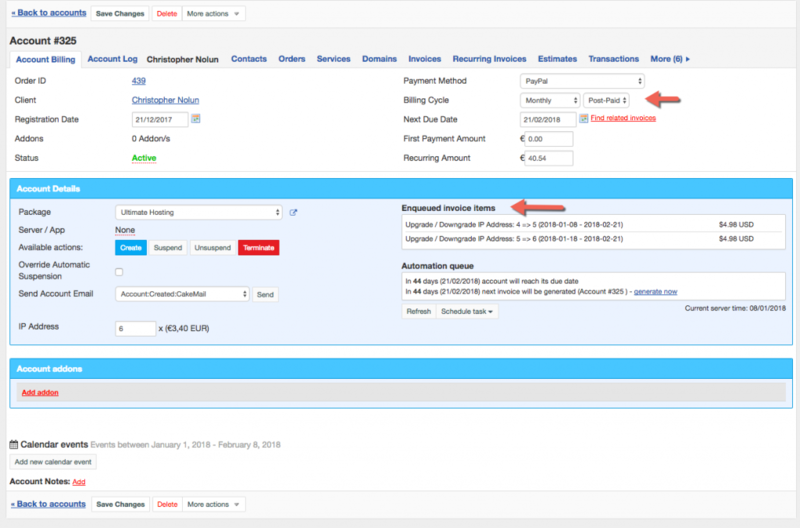 Additionally, in account details you can view the list of services and charges applied automatically to the next invoice (Enqueued invoice items).